It always started with a certain song – Brown Eyed Girl by Van Morrison. I used to go out dancing with the girls and it was always this song that lured us onto the dance floor, where we’d stay until the lights came up. In the following years, I returned to a variety of dance floors until the unpredicted diagnosis of arthritis. On New Year’s Eve, I had the chance to recreate the memory of those bygone days. 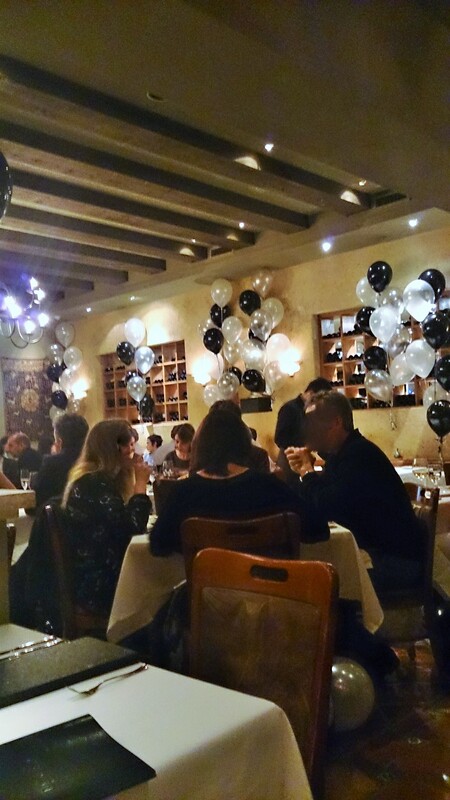 The classy restaurant where we chose to spend our evening was charmingly adorned with streamers and clusters of balloons floating above tables, with a few loose runaways bouncing over the glossy stone floor. Flushed mahogany wood complimented burnt orange walls creating a warmth that added a touch of comfort amid the opulence. People swept in with a variety of outfits – sequined dresses and furs mingled with the chic, casual and comfortably elegant. 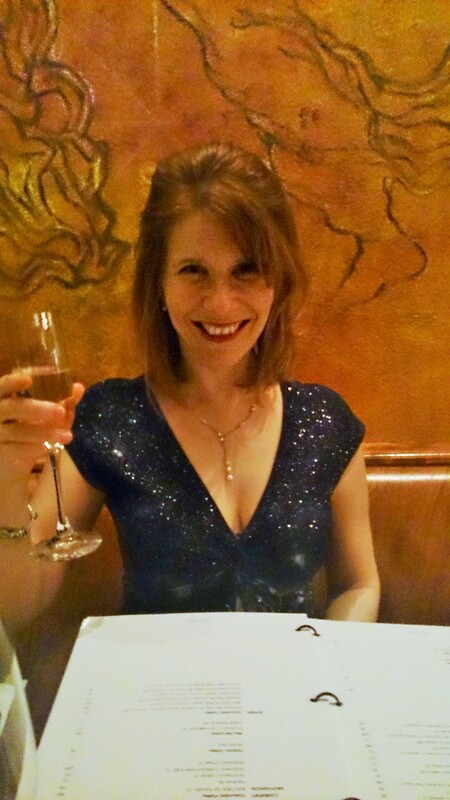 After a welcoming glass of champagne and a delectable appetizer of buffalo mozzarella with a heavenly endive salad tossed in a delicate lemon dressing, I excused myself to the ladies room – to my surprise, I passed through an open area where a deejay was playing music and a small group of people were dancing. I ran back to the table to announce to my better half that there was dancing – and then, as if on cue, those first notes of Brown Eyed Girl rang out. I dragged him to the dance floor where we spent most of the night until the countdown to 2015. I danced like I did when I was twenty. Old Lady RA vanished in the music and memory (or perhaps it was the wine) but regardless, I took advantage the way only people with arthritis can when their demon pulls a vanishing act. We danced to old favourites beneath a net filled with plump balloons. At the stroke of midnight they burst from their mesh cage, floating around us and the first song of the New Year ignited the dance floor – Summer of 69 by Bryan Adams. There could not have been a more appropriate message for me to begin the year. This song has always had special meaning, not only for the wonderful message it conveys (we’ve all had that one amazing moment in life that we would go back and repeat) but to the memories it evoked. It took me back to the small town life I have always called home, despite the many places I’ve lived. There are no other memories that are as vivid as those wistful moments, and no dreams as powerful. Two of my childhood aspirations surfaced in that time and have come to fruition, in spite of arthritis. Oh, and of course, I may have babysat for his cousins. One of the kids showed me a letter, proudly stating it was from his cousin Bryan Adams. Lost in the focus of my caregiving duty, I barely glanced at the letter as I patted his head and sent him off to bed. A few years later, a picture of him with the singer was in the paper. I adore the unexpected secrets of small town life. What a great story and a reminder to celebrate those good days in our life. Happy New Year. A very Happy New Year to you Carla. Sending you healing energy for a better year. Cheers. I, too, have a weakness for Van Morrison’s songs. And dancing, there is nothing like it. The euphoria that you feel as you lose yourself in the music. What a lovely New Year’s Eve you had. Must make it a repeat for this year! Yes, I will definitely make it a repeat 🙂 I know how much you enjoy getting out on that dance floor too, so I’m hoping you have many moments of getting lost in the music this year. Oh, what a lovely good time you had, J! I’m so pleased for you–and pleased that the mean old lady took a night off so you could enjoy your New Year’s night out properly. You looked absolutely beautiful. I’m secretly doing a “happy dance” for you (because you don’t want to see me dance in real life, trust me:) What an awesome update! I’m so glad you were able to put your dancing shoes on and enjoy the evening. All the best to you, and hoping you get more opportunities to dance the night away. Thank you Kim, I hope to be able to put them on again. Sometimes shoes can be tricky with arthritis 🙂 Wishing you a happy healthy year. Cheers. Happy New Year’s to you,J.G.! Glad that arthritis stayed “home” on New Year’s Eve and you had some fun and games. That and a positive attitude goes a long way in the dance that is named arthritis.